I love pizza night but what I love even more is impromptu pizza night. This was made because I was really in a pizza mood and not a salad mood, and also because I found a package of bacon in the freezer I didn’t know I had (yesss!). I had already thawed this chicken for the salad that never was but I didn’t have any red sauce ingredients. I whipped up a flavorful white sauce made with a bacon grease roux. It’s as fabulous as it sounds and it gives the pizza a creamy, cheesy layer with a hint of smokiness from the bacon. It’s almost like an alfredo sauce if I had to compare it to something. I would have just drank the sauce for supper but I had all of those awesome toppings and my favorite crust ready to go. This pizza was AMAZING. My favorite dinner I’ve made in ages and it got me the ultimate compliment. My Main Taste Tester actually told me that he thought this one was BETTER than the Bacon Double Cheeseburger Pizza (AKA his favorite meal in the world). Have I sold you yet? Cook bacon in a large skillet. When crisp, set aside on a paper towel lined cutting board to cool. Once cool and fat has drained, discard paper towel and chop the bacon coarsely. Using the same bacon skillet, (take out excess grease if you have more than a quarter cup), sprinkle flour over bacon grease on medium heat and cook for a few minutes, stirring frequently. Add chicken stock and whisk constantly for several minutes, cooking until sauce is thickened. Add cream cheese and stir in until melted. Add spices and stir until combined. Depending on how thick you want the sauce, add a little more chicken broth to thin it out if desired. Remove from heat and set aside. Line a large cookie sheet with parchment and drizzle with olive oil. Stretch pizza dough out on the sheet. 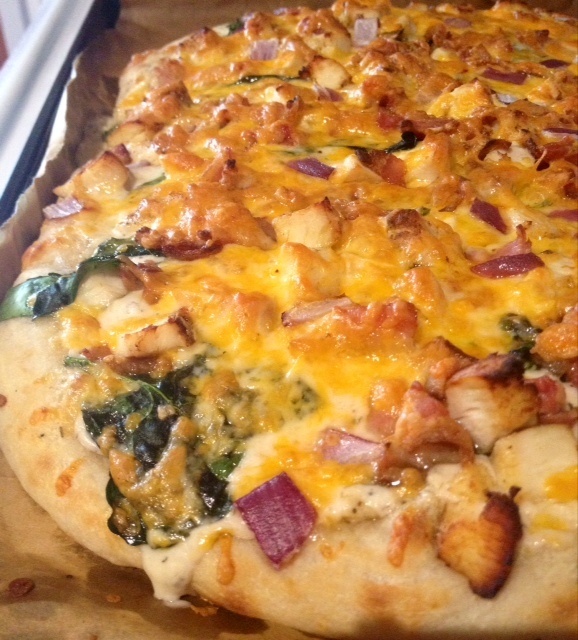 Spread sauce out over dough, followed by the spinach, chicken, bacon, red onion and finish with the cheese. Bake for 15 minutes, broiling for an extra two minutes or so at the end, watching closely. When crust is crisp and cheese is bubbly remove from oven. Let stand for a few minutes and then slice and serve. Note: This sauce recipe makes a lot. We like our pizza saucy and I still had a bit left over. If you have any extra, it would be great on pasta, or as a sandwich spread or warm dip!